So you’ve been dreaming of fluffy woolen clouds grazing and growing your very own fiber? If only it weren’t so complicated! You can’t just bring home the woolies and park them on the lawn, after all. The truth is there are just a few things you really need to get started keeping your own flock of sheep. Most of the products I recommend have a link to Amazon, so you can get what you need from one source, or I’ll give you some idea where to look locally. 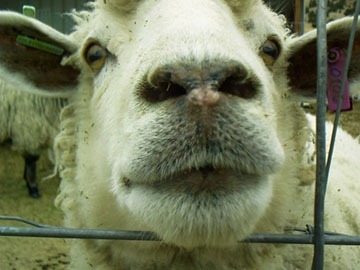 Electric fencing for sheep can be a great option if you’re putting them out to pasture at all. There are many portable set-ups which can be easily moved from one area to another to discourage overgrazing in your animals’ favorite spots. An electric wire around the pens can be beneficial for keeping out coyotes, dogs, or other predators as well. Tip: Keep everything spaced by 16 feet, including chutes and gates. If you need to connect two pens later, or extend them, it is simple to grab a spare cattle panel and simply wire it into place. Some ranchers get by for years and years with no more than a couple of old metal tubs for food and water. This is a great use for used bathtubs salvaged from renovations. Ranch supply stores sell durable rubber or plastic livestock feed bins that won’t buckle and dent if the animals kick them. If you want to get a little fancier, a rack for feed helps keep hay out of the wool on the sheep’s backs. Whether you feed from a purchased rack or in an old tub, it helps prevent health problems to keep the feed off the ground. Parasites and diseases can be spread if the sheep are getting their feed from any surface which can’t be cleaned at least occasionally. A rack for salt and mineral blocks is a great idea, too. Don’t underestimate the need for a good source of hay. If you live in a drought-stricken area, it may be very hard to come by reasonably priced hay and you should find a source before you bring home your sheep. Try asking neighbors who have animals where they get their hay, or even if you can share a delivery with them next time they order from their supplier. Hay is much cheaper in large quantities and a hay farmer is much more likely to deliver if you are buying a lot! Even if you happen to have a big, fabulous pasture, you need to stock up on hay. 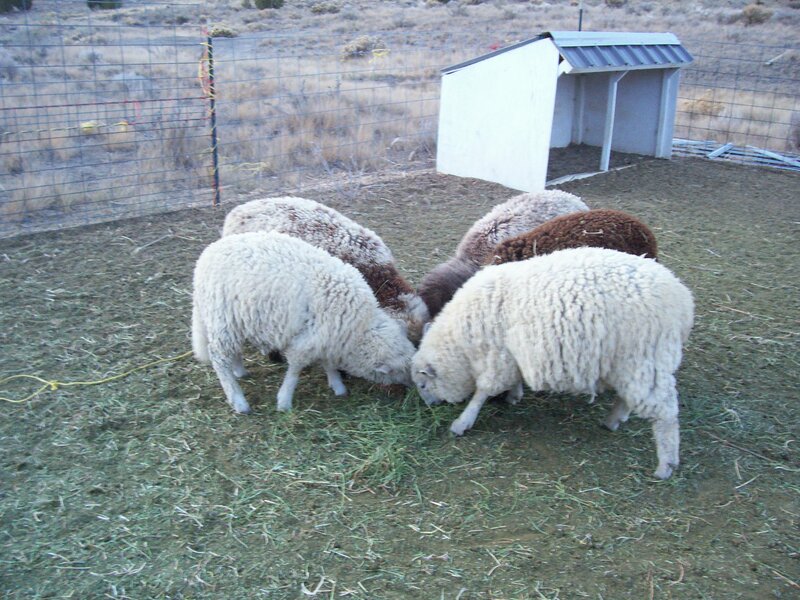 The high protein in pure alfalfa is deal for good wool production, and a small amount every day even for pasture-fed sheep will help ensure a consistent source of some nutrients and fiber in their diet that is hard to measure with pasture alone. That little bit of hay takes the edge off their hunger, too, and makes them a whole lot less likely to find the hidden weeds in your pasture which can make them sick. When winter comes and your pasture is lacking, the sheep are used to the alfalfa and can rely on its rich nutrients without feeling sick to their stomachs. How would you feel if you went from a diet of celery sticks to eating nothing but ice cream? Not all vets are created equal. Even an excellent large animal veterinarian may be focused on horses only and know very little about sheep. Ask around. Check the Yellow Pages or the Internet. Most vets are willing to refer you to a more appropriate colleague if they are unsure of their ability to help you with your ovines. Once you have found the sheep vet, keep his phone number handy, not just for emergencies. Your vet is an invaluable resource when it comes to knowing about local health issues. Parasite control, vaccinations, mineral or feed supplements– there are all things that vary widely by region, and your vet can help you set up a calendar for caring for your sheep. This is your on-hand resource to learn everything from “when to call the vet” to “shearing your own sheep.” If you plan to breed, don’t try to do without this resource. If you are inexperienced, a good book can literally be a lifeline for a weak lamb or a sick ewe. I highly recommend Storey’s Guide to Raising Sheep. It has been around for a long time, with some updates that keep it the most comprehensive book available for raising sheep. Bloat. It doesn’t sound good, and it isn’t. Think of it as deadly indigestion. Lots of medicines can wait for a few hours while you run to the store, but if your sheep are showing signs of bloat there is NO time to lose! Always have a small bottle of inexpensive anti-bloat medicine on hand if you’re keeping sheep. You probably won’t need it. But if you do, it will save your animal’s life. 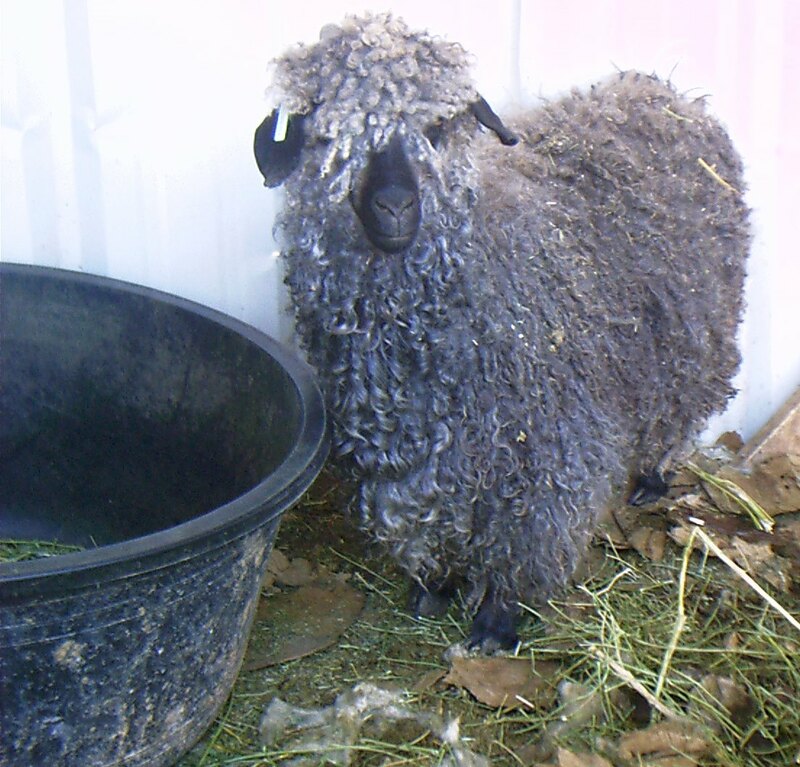 If your sheep get into wet pasture, new pasture, suspicious weeds, an open grain bin, or anything else that might give them a stomach ache, you may need to treat them. Keep an eye out for distended bellies– especially on the left side where the rumen is– and a sheep with no energy, no appetite, head held low, or making low grunting sounds of pain. Follow the directions on the bottle for administering to your sick critter. One evening during lambing season, we came into the barn where our ewe, Lucy, was penned with her spotted twins. We found the lambs crying, the gate to the pen wide open, and Lucy with her head inside the grain bin. We took one look at her huge body and knew that she was eating herself to death. We saved Lucy because we had the medicine on hand. She is retired from lambing now, but will always be remembered as my greedy ewe with the amazing fleece and prolific lambs. Tip: For preventative medicine, try a bloat block. This is a kind of mineral supplement block which helps prevent sheep from getting bloat– kind of an antacid for sheep. Another less expensive solution is to keep a small dish of baking soda (available at most feed stores) out for them to eat if they need it. They will know to nibble at it if they aren’t feeling well. These aren’t solutions for an animal who already has bloat but may help prevent that problem. Internal sheep parasites. One of those topics nobody really wants to talk about, but nevertheless a problem that needs to be dealt with if you are keeping sheep. Some animals are more prone to having problems with parasites, and some locations encourage it. A regular program of de-worming your sheep is fairly easy to establish and will save you from ever dealing with the other health problems that parasites can bring. Ask your vet about recommended practices for your area. Many sheep handlers recommend giving a dose of wormer as soon as you bring home your animals since you don’t know what kind of treatment they have been receiving. One of the best is Ivomec injectible for cattle and swine. Follow the instructions for injecting swine to get the correct proportions for sheep. Syringes are available anywhere the Ivomec is sold. It should be injected subcutaneously in the bald armpit area behind the front leg, being careful not to inject into the joint itself. Tip: Ivomec is a chemical, and if you are trying to raise your animals organically you should avoid it. There are other options which are effective for control, only using the chemicals as a last resort if they are failing. Also, residual Ivermec in the dung of animals can kill off earthworms in your soil, so it should not be used as fertilizer in your garden. Just like people’s, sheep toenails grow long if they aren’t cut. Unless you are raising them on very rocky ground, you will need to trim their toes twice a year. These clippers look a lot like a gardener’s pruning shears, with sharp tips. You will know you’re really a shepherd the first time you hold their little feet up for clipping and fight with them while wielding blades! They don’t want you to, but it is for their own good. TIP: An old tire is a great help for trimming sheep toes! Park their bottoms in the tire, feet in the air, and they stay docile while you trim. Wool clippers will become very important for one day each year if you have sheep. I don’t recommend that you run out and get them before you get your sheep, so I was hesitant to put them on this list of necessities for starting out. You certainly don’t need them to keep sheep. You do, however, need them to shear the sheep! You may as well be armed with some knowledge about shearing. Don’t imagine that an inexpensive set of dog grooming clippers will work. They won’t. Sheep wool is dense and packed with greasy lanolin. It will probably clog up the blades and burn out a motor on small grooming clippers before you finish shearing just the neck of your sheep. Alternatives to purchasing your own clippers include painstakingly clipping with hand shears or special scissors, or else hiring a professional who has already invested in the heavy-duty sheep shears. Experienced sheep handlers have a way of grabbing the head of a sheep, leading it, and controlling it without a halter. it’s a mystery to beginners how they do that. You’ll want a halter. The first time you clip those toenails or shear that sheep, in fact, you’ll be glad you had it. TIP: Inexpensive rope halters, sometimes marketed as “calf halters,” work as well as fancy nylon strap sheep halters. Unless you plan to go into the show ring with your sheep, this is one time when the cheaper model probably works better! If you decide to get into breeding, showing, or increasing your flock, you may want more stuff. But if you have these ten things, you really can get started keeping your own sheep. You don’t need expensive stock trailers, exotic medicines, or years of experience. Put a few sheep in the minivan and bring home the wool! All text, photos, and graphics are the property of Kelley Adams or are the property of Amazon.com where they link to products available there. One Response to "Ten Things You Really Need to Start Keeping Sheep"